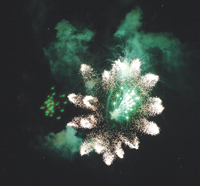 Fourth of July revelers can enjoy fireworks shows in both the north and south valley, with pyrotechnic displays offered this year by both Sun Valley Resort and the city of Hailey. The Sun Valley show will begin after the July 4 Sun Valley on Ice show, which features 2014 Olympic bronze medalist Gracie Gold, 2014 Olympic bronze medalist Jason Brown and 2014 U.S. junior gold medalist Nathan Chen. Resort spokesman Jack Sibbach said he expects the fireworks display to begin at about 10:30 p.m. He said fireworks will be launched from Dollar Mountain. The Hailey show is set to begin at about 10:20 p.m., with fireworks launched from near the Wood River High School football field. Hailey Fire Inspector Christian Ervin said the launch site will be closed to the public. However ample viewing space is available in the area. Ervin said the show is expected to last about 30 minutes. He said that as in the past, the public is asked not to bring their own fireworks, particularly illegal aerial devices. As in the past, professionals will be launching the fireworks, as the city has once again contracted the show to Lantis Fireworks & Lasers of Draper, Utah. “Enjoy this year’s show,” Ervin said.